We are currently in the studio finishing up mixing our new album. After 6 months of writing, and a month in the studio, we're super excited about what we've created. Keep in touch with us via those internet links for release date information and tour dates. 2012 will be an exciting year, and we can't wait to experience it with all of you. See you all soon! We are currently @ 1867 Recording Studio mixing our new album. We’ve spent the past 3 weeks here tracking and we couldn’t be happier with how it is turning out! 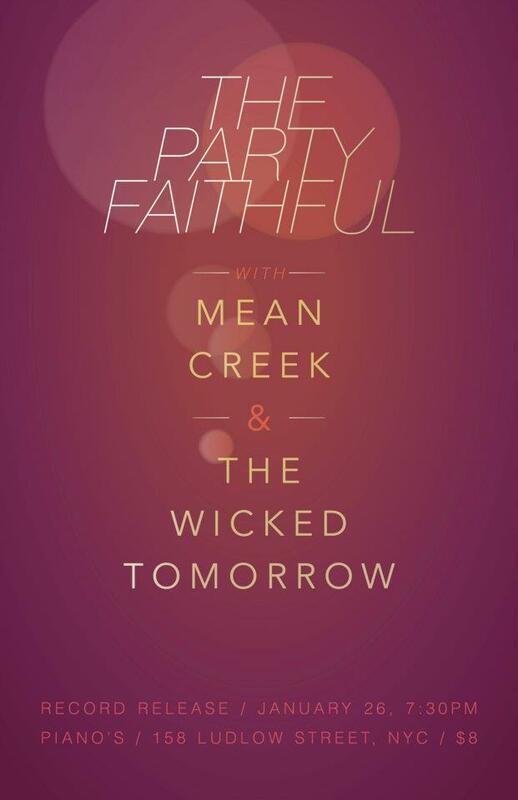 One week from today on Thursday January 26 we will be in NYC playing @ Pianos with our good friends The Party Faithful (who will be celebrating the release of their new album), and The Wicked Tomorrow. 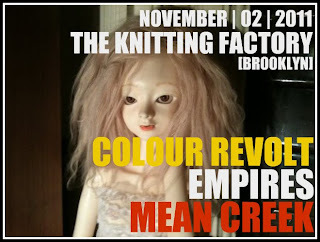 Very excited, come party with us! I can’t tell you all how happy I am to say that after 4 months of writing a whole batch of new songs in the practice space with my 3 best friends/3 favorite musicians in the world, our recording dates are booked! It all starts December 28 @ 1867 Recording Studio with the loveable Chris McLaughlin. As far as the new songs, we’ve learned a lot from one another these past 3 years of being a band, and it continually amazes me how we all work together, stay in tune with one another, and remain close friends. These new songs are by far the best we have ever made as a band. I’ve been playing guitar since i was a kid, and I feel very happy knowing that I am in the band I always wanted to be in, writing the album I always wanted to write. As far as the release of the album, we’re planning a Spring 2012 release. We’ll have more info and details on this in the upcoming months, so stay tuned! See you all very soon. Have some happy holidays! Voting ends tomorrow night November 9 at midnight in the Boston Music Awards. We’re up for “Artist Of The Year”, “Album/EP Of The Year”, and “Song Of The Year”. If you’d like, you can vote for us and/or many other great bands HERE! We’ll be going in to 1867 Recording Studio to record our brand new full length album in late December with good friend/engineer Chris McLaughlin. We couldn’t be more excited about it. Can’t wait hit the road and release this new music to all of you in 2012. Before then we’ll be finishing up 2011 with 3 very special hometown shows. We’ll be taking part in the Buffalo Tom 25th Anniversary shows. 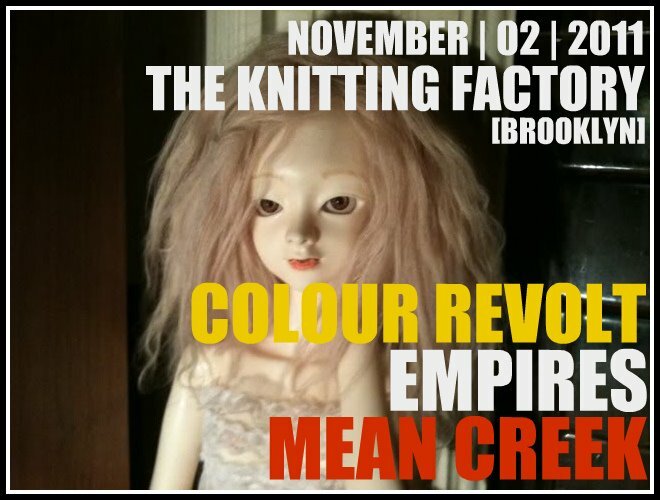 They’ll be doing 3 nights @ Brighton Music Hall in Allston, Nov. 25-27, and we’ll be playing November 26. They have some very exciting guests planned, J. Mascis, Ted Leo, and many more. As lifelong fans of Buffalo Tom, we couldn’t be happier to be a part of this celebration of their music. You can get tickets HERE. Here’s to finishing up 2011 with a bang, and looking forward to 2012. We’ll see you all soon! 2011 Tour Dates - NYC & DC This Week! We'll be playing Brooklyn, NY this Wednesday November 2 @ Knitting Factory w/ Colour Revolt, and Empires. Then heading to Washington DC the following night Thursday November 3 to play @ Red Palace w/ The Features! Should be a great couple shows, can't wait to see you all again. We've also updated our facebook tour dates page with all upcoming shows for the rest of 2011 before we go into record our new album at the end of December. You can view the dates HERE. See y'all at the shows! First off, we'd like to say thank you to the Boston Music Awards for nominating us for "Artist Of The Year", "Album/EP Of The Year (Hemophiliac)", and "Song Of The Year (Sunlight)". If you wish to vote you can do so HERE....and if you REALLY want to support us, come help us raise funds for our new album by partying with us tonight @ Brighton Music Hall! 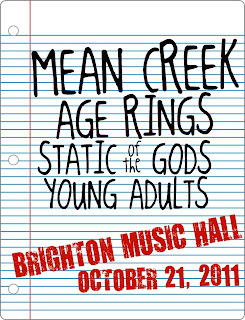 We're playing with 3 great Boston bands, Age Rings, Static Of The Gods, and Young Adults. It will be an epic night. See you at the show! "Sunlight" on WFNX & Boston/Brooklyn Shows! 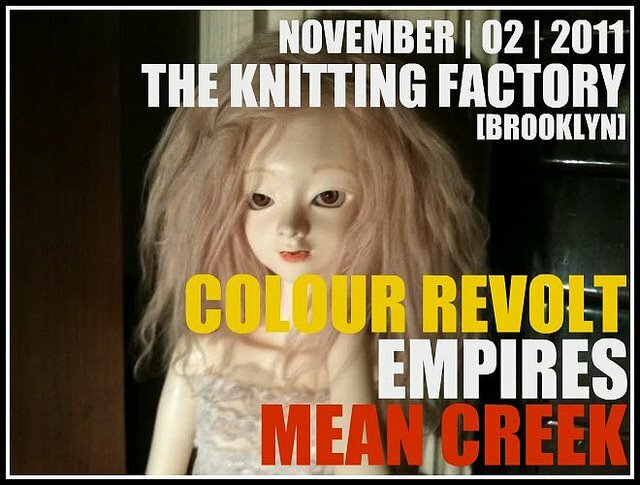 Brooklyn/NYC friends - we'll be playing November 2 @ Knitting Factory with 2 great bands, Colour Revolt, and Empires! Can't wait to see all your pretty faces again.